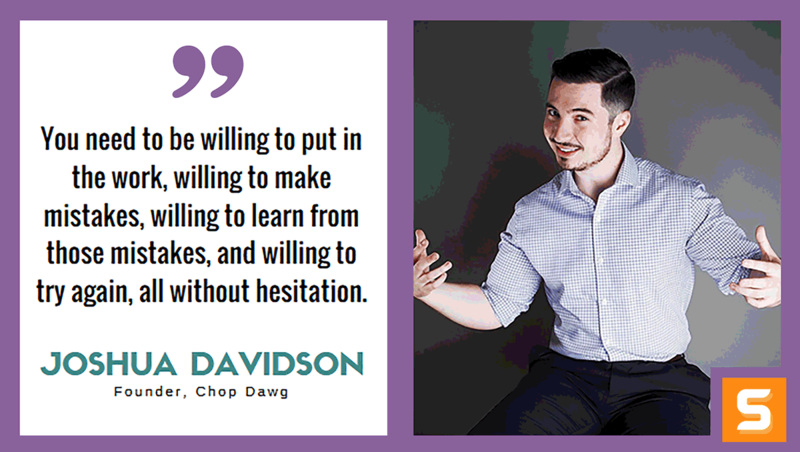 Joshua Davidson is an entrepreneur, speaker, startup advisor and founder of Chop Dawg. He has been creating companies since he was in high school at the age of sixteen. In a nutshell, Joshua spends most of his days building products and growing companies. He has been personally featured in major publications such as MSNBC, NBC, Fox, Technically, AOL, Mashable, EliteDaily, Huffington Post, CBS and the Examiner. Since founding the company in 2009, Joshua has been on a mission with his team at ChopDawg.com (Chop Dawg) to make a difference and impact as many entrepreneurs as possible. Joshua and his team are doing this by helping their clients turn their brilliant ideas into beautiful products and powerful brands. They strongly believe that by providing both an incredible range of services together with their knowledge and expertise in building startups, they can help those who are most passionate about their ideas to enter their respective markets and generate the type of traction necessary to make their venture a success. In the interview below, Joshua talks about his entrepreneurial journey and his top advice for anyone looking to take the leap and start a business. For latest happenings at Chop Dawg and to get updates on Joshua's latest talks, follow him on Twitter. Solve a problem better than anyone else. Provide more utility than anyone else. Offer more customer service than anyone else. Make your product and/or service easier than anyone else. How did you get the idea for Chop Dawg? Is there something you wanted to do different or better than your competitors? Back in August of 2009, I realized already that the world was moving mobile and becoming completely software driven. Unfortunately, the service industry wasn't catching up to this. Either you dealt with an American development firm that would charge you a second mortgage to create your app, and it would end up being an incredibly expensive toy, or, you outsourced overseas and more often than not, dealt with a horror movie plot. The solutions stunk. I realized then and there, there had to be a better way and created ChopDawg.com to solve that problem. A one-stop shop, where you can not only bring your app idea to life in a much more affordable pricing model, but as well, a one-stop solution to help you with your marketing strategies, maturing your product idea, train you on how to become an entrepreneur, assist in raising funds, and much more. All without having to outsource overseas or having to drop a $250,000.00 bill for someone. To be honest, it was right after the launch of our first official application called at the time PartyHopp. I remember the conversation that I had with the client vividly where he not only thanked us for a job well-done, he explained to me that we turn his dream, his vision, his passion into a real, tangible thing. That was the moment I knew we had something special and could run with it. It's hard to say the next five years, but our grand scheme is simple. We want to be the company that inspires individuals to become entrepreneurs, a resource for entrepreneurs to help scale and grow their companies, and a place to help turn great ideas, whether they're mobile, the web, software, wearable, VR or any future technological advances, to life, all under one roof. Most businesses evolve over time. Is there a way that you slowly evolved the mission of Chop Dawg to serve your customers better? Absolutely! When we began, you could argue we were more-or-less a glorified freelance website design studio that you would had found on any city corner from 2007-2011. We realized early on how much more capable we were and the type of impact we could bring to our customers. We're continuing to expand now as we experiment with VR. Our market and the quest for providing value doesn't stop. What attitude/habits helped make you successful while starting Chop Dawg? Persistency. Consistency. That's it! You need to be willing to put in the work, willing to make mistakes, willing to learn from those mistakes, and willing to try again, all without hesitation. Think of this as working out. It takes the time to develop this and it only gets stronger each and every time you do. This is the attitude, mindset, a habit we have to drive us for success. Easy, over-promising and then under-delivering. You need to realize early on, you need to solve your customer's problems and meet expectations. Once you know you can, then slowly over-delivery while keeping expectations the same. This produces great work, and something clients will not only love but keep coming back for. This is a tough one, but I'd say the first time we had a customer raise funding through investors with a product that we built for them. That was all the validation we needed to know we can do whatever we set our minds to. That to me was the biggest milestone we accomplished to date. We have helped countless others since, but that first one, that is the barrier that is difficult to do. What makes Chop Dawg unique from others? How did you find your competitive advantage? Our focus on customer service. We are a customer service company, first and foremost, that happens to offer additional services for entrepreneurs. We only exist for our clients and put them on a pedestal. That is our competitive advance. That is what got us to this point and keeps us growing. We care more about our clients than anything else. This is an easy one for an entrepreneur. We are motivated to continue to grow, to continue to impact others, to continue to take care of your own team and to leave your dent in the universe. Every day we aren't growing, we are dying. We want to be around for awhile and that alone is what drives all of us at Chop Dawg, each and every day. What advice would you give to our readers who want to start a business in Pennsylvania? Where should they start? Simple. Solve a problem better than anyone else. Provide more utility than anyone else. Offer more customer service than anyone else. Make your product and/or service easier than anyone else. Then stick to it. Never lose sight of the fundamentals, but keep pushing your own envelope too to better provide value and service to others. Remember. Persistency. Consistency. Nothing else. The formula is easy, but the output is hard because it requires hard work. You need to be willing to put in the work.